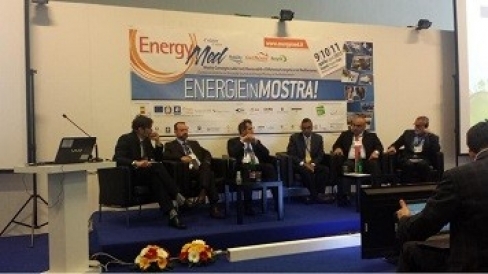 The 10th of April, MED-DESIRE took part to EnergyMed, the annual Conference Exhibition on Renewable Sources and Energy Efficiency, with the Capitalization Event “The role of the renewable energy sources in the Mediterranean Region: from buzz to action” promoted by the Italian Ministry for the Environment, Land and Sea connecting more than 100 participants (including professionals and companies coming from the energy sector). The initiative involved institutional representatives: Giovanni Brunelli, speaking on behalf of the Italian Ministry for the Environment, Land and Sea about MED-DESIRE project, who underlined “the essential need of the exchange of technologies and good practice with the Mediterranean Countries”, Abdelkader Baccouche, Head of Department of the Tunisian National Agency for Energy Conservation (ANME) who presented the state of the art of Renewables Energy in Tunisia stressing the importance of a “real public-private partnership based on a win–win approach between stakeholders” and Pierre El Khoury, General Director of the Lebanese Center for Energy Conservation (LCEC), who talked about the potential of Solar Energy technologies in the residential and industrial sectors, highlighting how much “financing like NEEREA, a national financing mechanism initiated by the Central Bank of Lebanon in collaboration with the Ministry of Energy and Water, the Ministry of Finance, UNDP, the European Union (EU), and the LCEC, is the key to market development”. - Session II – “Mediterranean distributed solar technology market: barriers, challenges and perspective” devoted to the latest technological development on solar energy and the tools to remove barriers preventing distributed solar technology developed by Enea and Ciemat in the framework of the WP 5 – MED-DESIRE Project. The event also included contributions of International actors: Myriem Touhami, Program Manager of the Division of Technology Industry and Economics, UNEP-DTIE, speaking about the international Financial Institution strategy for increasing investment flows to renewable energy and energy efficiency technologies, Raphael Weyland, HIR Hamburg Institut Research GmbH, presenting the solar obligation in Baden Wuerttemberg and Loreto Valenzuela, Center of Energetic, Environmental and Technological Investigations - Solar Platform of Almeria (CIEMAT – PSA), introducing the Concentrating Solar thermal Power (CSP) for small and medium sized installations. The workshop was also the occasion for Annalidia Pansini, WP6 Coordinator, MED-DESIRE Project to present the study “Financial support mechanisms for distributed solar technologies and energy efficiency deployment in Mediterranean countries”, accomplished within MED-DESIRE Project, which focuses on the financial support mechanisms to stimulate the diffusion of solar technologies in the Mediterranean Region. The final part of the meeting was dedicated to “the companies’ perspective”, a round table where companies from Egypt, Lebanon, Tunisia and Italy (SEDA, Egypt – Sun Infinite, Egypt – Soltigua, Italy – Phoenix Group, member of Indevco, Lebanon - Ires, Tunisia) discussed about the most recent financial, technological and regulatory developments on the renewable energy and energy efficiency issues underlining the opportunity and the barriers.